Use Socratic Seminars to provide students of any age the opportunity to discover their thinking. The whole class seeks to understand the details of an issue. However, the purpose of a Socratic Seminar is for individuals to work out their personal beliefs as a result of the discussion. There are so many advantages. When working together in a big circle, the teacher is able to teach students how to talk to one another at the same time. In a sense, the seminar serves as an anchor lesson for discussion. 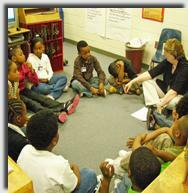 Teachers refer students back to the procedures they learned in the larger circles when they move to smaller reading groups. Teachers groom leaders who run the circles eventually. Readers work at the highest levels of thinking when they’re in charge of reading, writing the questions, and leading their peers. Socratic seminars may be messy at first. Students may need several seminars to realize that “thinking” is valued over “winning”. Once the students sit through a few sessions, they understand the purpose. Setting and assessing personal goals for each seminar helps also (as explained below). No matter how messy your first tries, over time students will improve. NOTE: Learning targets will change as students become more sophisticated in Socratic Seminars. I can read and prepare an article for discussion. I can participate in a big group using the argue-safely language. I can jump into a conversation and participate without raising my hand. I am willing to change my mind when confronted with new information. I can improve in discussion skills by setting, assessing, and resetting goals. I can discover main ideas and themes through reading, thinking, and discussing with my peers. Select a text that is difficult to understand, not one that is difficult to read. The article should be of interest and lend itself to thought-provoking discussion. Many teachers select topics matching objectives to be mastered in content areas. In an ideal world, students have a copy on which to write. Time for Kids allows teachers to reproduce their news articles for FREE. Also, they provide texts in grade-level clusters: K-1, 2-3, 4-5, and middle school. The teacher sets a date and time for the seminar, usually one time per week. Some teachers introduce or conclude unit topics with seminars. In that case, sessions would be held less often. To give everyone a chance to have a say, I ask students to contribute 3-5 times not counting the opening and closing questions. Therefore, a seminar runs about 45 minutes. You need that much time so that everyone can participate equally. The students prepare for the seminar by reading the selection in class or for homework. They mark the article by underlining, highlighting and/or coding. They note questions to bring. In addition, students ultimately come ready to share generalizations: big ideas and ways to apply to the concepts to their individual lives. I will be willing to change my mind. I will refer to the text, other readings and other people to support ideas with evidence. I will ask questions that demonstrate my thinking. I will listen to participants carefully. I will follow up other participants' remarks with comments, questions or compliments. Since I am shy, I will try to speak 3 times. Since I have a tendency to talk a lot, I will only speak 3 times. I will learn about topics from many perspectives. I will encourage others to speak by asking them to participate. I will argue safely using language that engages others in the conversation. We haven’t heard from ____ today, and I would like to know what you think. 7. The leader cannot participate except to keep the conversation flowing. When just beginning to model how Socratic Seminars work, the teacher probably will break that rule to help students understand how the circles work. In school, students’ eyes are on the teacher because they seek approval. The reason for getting out of the middle of these discussions is so that readers will talk with their classmates to determine what they think without the leader’s influence. 8. It’s critical that the group sits in a circle so that everyone can see everyone else. If your room is small, teach students to move their chairs to places surrounding the desks. I actually assign spots so that students can move into a large in circle in 3 seconds. To change the environment, move to a large room conducive to creating a large circle of chairs. Meet outdoors occasionally. • Read one sentence from the article that you think is very important. • If you had to summarize this text in one word, what would it be? 10. The students do not raise hands. This concept alone is difficult. It requires learning how to jump into a conversation to get your ideas heard. 11. The leader continues to work from the list of questions she prepared ahead of time. The questions move from the literal - making sure everyone understands the facts - to inferential and application. I take my cues from the participants. I may have great questions planned. However, the discussion may veer of the course I envisioned and so, I make up questions to help it move along. I like to read a quote from the article, and ask a question about that quote. I also like students to quote what they think is important and explain why. 12. I keep track of who is talking on a seating chart for 2 reasons: (1) to be sure everyone has a chance to participate, and (2) to analyze the dynamics when I lead seminars. From the information I gather, I encourage individuals to work on their needs or fine-tune how I facilitate the group. In middle and high school, I find that students like to work for points. When keeping track, I can assign them points for participation. • Read one sentence from the article that you think is very important. Tell us if that is that the same or different than at the beginning. • If you had to summarize this text in one word, what would it be? Is that the same or different word? • Tell us one important idea about which you changed your mind. • Tell us one detail that you understand more clearly as a result of the discussion. 15. Students return to their seats and write in notebooks. They evaluate whether they attained the goal(s) they set for themselves at the beginning. They make notes about goals for next time, also. Setting and assessing goals will take modeling. For more on reflection, read LikeToWrite.com. Karen’s plan for teacher preparation. How do I grade Socratic Seminars?